Above: For October's National Bullying Awareness Month, Falk Elementary School participated in Kindness in Chalk: An Anti-Bullying Movement. The event was sponsored by Falk's PTO, who organized families and community members to participate. Kindness in Chalk supported Falk’s SIP climate goal around perseverance and SEL Power Standard #2: Self Concept: Develop positive self-identity and recognize self as lifelong learner. As we approach Parent Teacher Conferences, you'll find a number of resources in this edition that will support your work to engage our families and tell the story of your school. Below you'll find resources to support understanding of the new elementary report cards, details about two upcoming parent group meetings, and an easy way for you to spread the word about the great things that are happening at your school. Speaking of great accomplishments, congratulations to our educators who were selected for Madison Magazine's 2016 M List, which highlights 32 mentors and teachers in Madison! Read more about these individuals below. Lastly, our final referendum info session will be held tomorrow, October 27 at 6:30pm in the Memorial High School Library. You can see more details below and find information about the referendum at www.mmsd.org/referendum. Are you prepared to talk with families about the new report card? With parent-teacher conferences right around the corner, we know many families will be asking questions about the new elementary report cards. The report card team has created many resources for you to familiarize yourself with these standards-based cards so that you are able to answer questions as they arise. The Family, Youth & Community Engagement Department is providing district support to the African American Parent Leadership Council (AAPLC) and a new Multicultural Parent Group, which focuses on ELL families. Both groups bring parents/caregivers from across the district together to connect with one another and build their capacity. Topics will be identified by the members of those groups and childcare, light food and transportation is available for both. Join us for the final Referendum Info Session tomorrow! The remaining referendum info session will be held tomorrow, Oct. 27 at Memorial High School (201 South Gammon Rd.) Library. Doors open at 6:00pm and there will be a presentation at 6:30pm, followed by Q&A featuring a panel of district representatives including the Superintendent, board members and district staff. Learn more at mmsd.org/referendum. We will be live streaming the meetings on Facebook. Go to facebook.com/MadisonWISchools to watch and take part in the discussion. See a video of the Oct. 13 session at La Follette. One of the keys to good security for any large organization is staff members having strong, up-to-date passwords. A number of staff have not changed their password since receiving their initial password from the District and this password is easily “discovered” because the components are simple to find. In November, the process to require MMSD staff members to change their password will begin. Check out the October edition of the MMSD employee wellness newsletter Live Well, Work Well. Topics include MSCR Fitness Programming, Breast Cancer Awareness, 30 Day Challenge, and a recipe for perfect pumpkin pancakes. Share good news about your school! Share positive news from your school with the community at large by submitting it via our Good News form below. 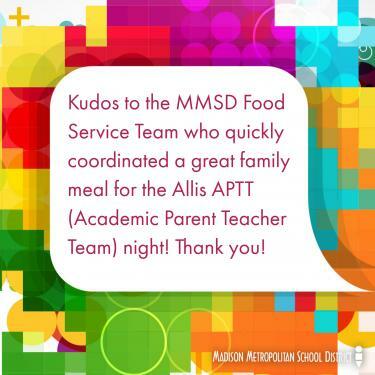 We can post your school's good news on school and district social media, the district website and in the MMSD family and/or staff newsletters! If we are aware of events and activities in advance, we may be able to request that media be present. Read on to see recent stories from Randall, Stephens, Olson and Sherman. Saturday, Oct. 15 was a beautiful day, not because of the weather but because of the people who spent the morning on the Randall Playground painting the beginning of their mural! All ages and all abilities worked hard, met new friends and caught up with old friends as the mural began to take shape. Randall Raccoons in collaboration with high school students from SAIL West and artists from Dane Arts Mural Arts will be finishing this mural over the next two weeks. As a way to raise funds to support student learning and fun activities at Stephens, our PTO hosted a Stephens Sprint Fun Run. All 570 plus students participated by running a course out on our school field. Bruce, the Memorial Spartan mascot, and Soar, our Stephens Eagle mascot, joined the students for a morning full of energy and fun. An Olson student recently came up to Sheri Boser, Olson/LMTS, asking if she could get a group together during 3rd grade recess to collect milkweed seeds. Boser arranged to go with her and five friends out to the prairie to collect bags of the seeds and more than twenty 3rd graders helped sort the seeds into baggies to take home. Because Olson students were interested in learning more about what was happening in the outdoor classroom, staff partnered with the Friends of Lake Wingra Monarch for Kids Program. They received training on monarch rearing and milkweed seed collection. Staff at Olson decided to send the seeds home with students with info sheets on how to plant them in March. Boser says, "The thing I like best is that students are coming to adults and asking to do projects they have an interest in here at Olson. This student initiated action really contributes to their sense of belonging. They have a stake in our outdoor classroom." Sherman's Fall Festival Night an opportunity to engage with data - and marshmallows! Sherman families had a chance to come together for a community meal and engage in different student data throughout the night on October 20. Soup and bread were provided by American Family Insurance, and Spanish teacher Ellen Roubal and students created a delicious squash soup to enjoy along with some chicken noodle and tomato soups. 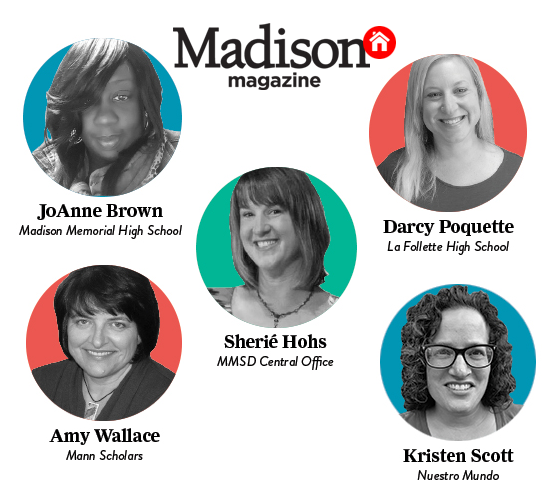 Madison Magazine's M List 2016: These 32 mentors and teachers are positively influencial, and we bet you recognize a few of them! The Wisconsin State Journal is offering the opportunity for high school juniors and seniors to be a part of the 2017 Senate Scholar program. Encourage juniors or seniors with an interest in representative democracy to apply! The empowHER Reading Series features original one-act plays and short screenplays written by emerging female writers and dedicated to issues affecting women in the 2016 election. An Uncommon Core is a play about teaching that was written and performed by Abby Swetz, an 8th Grade Language Arts / Social Studies Teacher at O’Keeffe Middle School. It received a reading in NYC on Sunday and Abby also performed it at the Kansas City Fringe Festival this summer. Nice work, Abby! Reminder! The Benefits Open Enrollment period goes until Nov. 15. This is your time to make changes to your health insurance, elect a 2017 flexible spending account and/or enroll in vision insurance (a new plan for 2017). Learn more about open enrollment. FMPS School Endowment grant decisions due Oct. 31: Fifty schools have $93,751 in endowment income to use to make grants. FMPS maintains School Endowments for each of Madison’s fifty public schools. Annual income from the endowments is used to support creative and innovative grants which enable projects and programs not otherwise funded through the core school budget. It is important for your school to use its endowment income every year. Learn more and see the School Endowment Grantmaking Checklist/Timeline. September FACE Liaison Professional Learning focused on FACE Action Teams & Equity: Thirty-three FACE Liaisons attended our first PLC meeting on Sept. 28 at Badger Rock Neighborhood Center. Here is a summary of the positions who are assigned as FACE Liaisons, meeting outcomes and Exit Slip Feedback. The next FACE Liaison PLC is on Wednesday, Oct. 26 from 4:30-6pm at Badger Rock Neighborhood Center. The Dept. of Student Services and MTI are holding an Informational Meeting on the Grow Our Own-Teacher Dual Certification Program TONIGHT! What's it like to be a black police officer in today's climate? Nuestro Mundo Community School student asks “What is cedar-apple rust?” in latest installment of Blue Sky Science. The MMSD Literacy and Arts Education teams are excited to offer two workshops in collaboration with the Chazen Museum of Art that introduce literacy educators, teachers of English, ESL, and drama, and media. The First Folio Teaches Teachers Workshop at Chazen Museum of Art will be held on Nov. 10 & 19. Concordia is offering a cohort for teachers who want to take classes for their ESL License. See the flyer to learn more about an informational session on Nov. 9. The opportunity is open to all staff, but you need to apply separately for the Tuition Reimbursement Program. First Act Children's Theatre is offering two productions for elementary students. First Act also provides study materials to help integrate the themes of the production with school curriculum.